The perfect summer vacation is a little different for everyone. 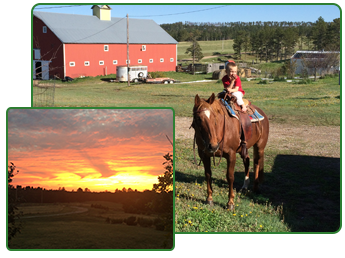 At Foster's School House in Crawford, Nebraska, we are surrounded by a variety of activities that appeal to all personality types — from the shy to the bold and from the experienced vacationer to the cautious beginner. We've got a wide range of fun adventures just waiting for you and your family. Your vacation in the Midwest will be a treasured memory for years to come! What better way to explore the area than on horseback? Like any Midwest vacation spot, we keep space where you can stable your horse comfortably, as long as you bring your own feed. The National Forest adjoins our land and consists of 75,000 acres. You have your choice of trails, with over 75 miles of marked trails to choose from. Some of the more popular trail heads in the Pine Ridge area include East Ash, West Ash, Coffee Mill, Spotted Tail, Roberts, and Outrider Trailheads. Another popular choice for horse enthusiasts is the Soldier Creek Wilderness Area and Trailhead. There are corrals and a fully accessible rider ramp. The system contains about 15 miles worth of looped trails. They are closed to mountain bikes and motorized vehicles, but open to hikers. While Nebraska isn't exactly known for mountains, we do offer some great opportunities for mountain biking. The trails open to horses are also open to mountain bikers, with the exception of the Soldier Creek Trailhead. There are trails that include sections guaranteed to challenge even the most experienced of bikers, while offering more leisurely rides for novices and family outings. A weatherproof topographic map of over 70 miles of marked bike trails is available for $5.95 through the Chadron Area Chamber of Commerce. Their address is P.O. Box 464, Chadron, NE, 69337-0464. Or, you can give them a call at (308) 432-4401. Be sure to bring plenty of film! No matter if your photographic interests lie in wildlife, birds, flora, or scenery, you'll find ample opportunities to capture some great shots. Our sunrises and sunsets are magnificent, and we have plenty of breathtaking vistas. Sportsmen delight in the hunting opportunities that abound in the Pine Ridge area. The elk is Nebraska's largest big game species. There are an estimated 200 to 250 elk in Nebraska, most in the Pine Ridge. Antelope occur primarily in the western half of the state with their major range in the Panhandle. The highest densities are in northern Sioux and Dawes Counties. The wild turkey is the largest upland game bird in North America. The turkey's range now includes most major river drainages and the Pine Ridge. 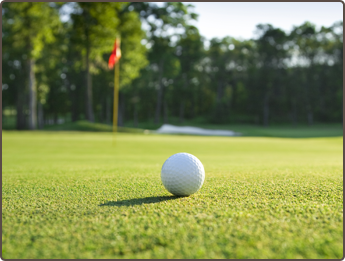 Ridgeview Country Club is a nine-hole golf course that overlooks the rolling plains southwest of Chadron. It is the home of the annual Don Beebe Chadron State College Golf Classic in late spring and early summer. There is a driving range, with rentals available for carts and clubs. Instruction is also available. The course is located South of Chadron, one mile down on Highway 385. Legend Buttes Municipal Golf Course is also a nine-hole golf course located just outside of Crawford. The site has incredible views of the rugged bluffs surrounding Fort Robinson. The course is located on the west end of Crawford on Highway 20. Nebraska has over 400 species of birds. Birds native to the area such as different types of Jays. Grab your guidebook and your binoculars, and you'll be all set. Stargazing is amazing under the Nebraska skies. Its unpolluted air and dark skies offer exciting opportunities for viewing. Spread a blanket out, and you can lay for hours gazing — but be careful, because the night sounds just might lull you to sleep!